In 1517, the usually tranquil friary in the Hungarian town of Körmend found itself at the centre of controversy when its Augustinian friars, charged with drunkenness, sexual abuses and liturgical negligence, were driven out and replaced with observant Franciscans. The agent of change in this conflict, cardinal Thomas Bakócz, claimed to be acting in the name of ’cloister reform’ motivated by a religious agenda, while the Augustinians portrayed themselves as the victims of a political game. Based on the surviving interrogations of a papal enquiry into these events, this book illuminates the tensions and potential conflict that lurked within the religious culture of a seemingly unremarkable and remote town. The story of the friary trial of Körmend provides a fascinating window into religion and society of Europe at the dawn of the Reformation, investigating the processes by which ordinary people emerge as historical agents from the written records. By focussing on their experiences as represented in the trial documents the book reveals the spaces and borders of individual and communal action within the dynamic of lay-clerical relations negotiated in a friary reform at the beginning of the 16th century. Furthermore, the moral nature of the accusations levelled at the Augustinians - and whether these were justified or instigated for political reasons - offers further insights into the nature of late-medieval Catholicism and the claims of Protestant reformers. 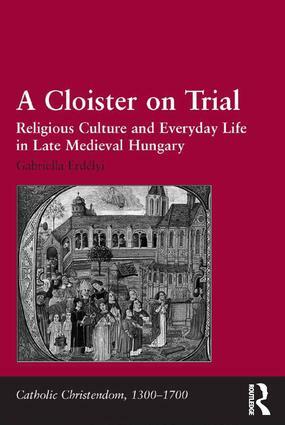 "The publication in English of A cloister on trial at a time when the quincentenary of the Reformation is being celebrated brings one of the best examples of Hungarian microhistory within easy reach of the interested general reader in Europe and beyond." "It constitues a very welcome addition to the growing literature that spans the late medieval and the early modern period, investigating continuities, and also provides a wonderful combination of microhistorical research with a macrohistorical questioning of the evidence." Introduction. Part I Contexts: The trial; The cardinal and religious reform. Part II Reading the Trial Text: The protocol; The witnesses; Narrative, memory, and identity. Part III Religion, Reform, and Reformation: Townspeople and friars; Religion; Morality; Ritual and community; The landlord; Conclusion: lay agency in reform and Reformation. Epilogue; Bibliography; Index. Gabriella Erdélyi (PhD 2003) is Senior Research Fellow in the Institute of History of the Research Centre for Humanities of the Hungarian Academy of Sciences, in Budapest. She is the author of Runaway Friars. Violence and Youth in Late Medieval Hungary (in Hungarian), 2011 and a number of articles on religion, church and society in the late medieval and early modern period.